For some reason I had not realized that this had been released already. I came across it accidentally while browsing Amazon so I grabbed myself the MP3 download. I've got quite a lot of music in my library and it occurs to me that I've not actually listened to Ultra Beatdown very many times since it was released, and that was four years ago! 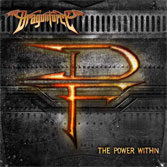 That's quite a long time without an album release but Dragonforce have been touring a lot and then busy recruiting a new singer before finally putting together this album. After the first listen I have to say that I was quite impressed. My favourites so far include Fallen World, Cry Thunder and Wings of Liberty. The band are still playing as fast as ever and the new singer fits in well. It's about time I had some more Dragonforce in my life. I knew it was April and put it on my wish list to remind myself, then forgot about it. Thanks for the reminder, I will get myself a copy too!